When Leslie and I were trying to decide what we wanted to make for she made, ella hace this month, my brain could only muster "soup". All I could picture were hands cupping a bowl with steam rising from the top. You'd get a good idea why if you took a gander out my window today. White as far as the eye can see. Small plants drooping heavy with the weight of the snow. Not much movement, aside from the eerily large crows flying past the barren branches set against a grey sky. And if by chance you were brave stepping outside, you would probably turn tail before you could get your second foot out the door. With the temperature sitting at a balmy 3 (wind chill making it feel like -15), well... Even the schools didn't open their doors today. What better way to spend the day than sitting indoors, looking out at the beautiful snow, slurping a bowl of soup. And if by chance you were to be slurping on THIS soup, you would probably even start stripping off some layers. Perhaps don your tank tops and bermuda shorts. Not only is it warm... it's spicy! A thin film of sweat on your forehead. Small beads across your upper lip. You'll forget all about that ill-guided attempt to venture outdoors. In case you hadn't guessed, Leslie and are bringing steaming bowls of Tomato Soup to the table for she made, ella hace today. My version is not the one that normally comes to mind when you think tomato soup. Instead of being thick and rich and creamy, it is brothy and earthy and very spicy - with noodles of roasted poblanos lacing every spoonful. It is unexpected, but entirely welcome. 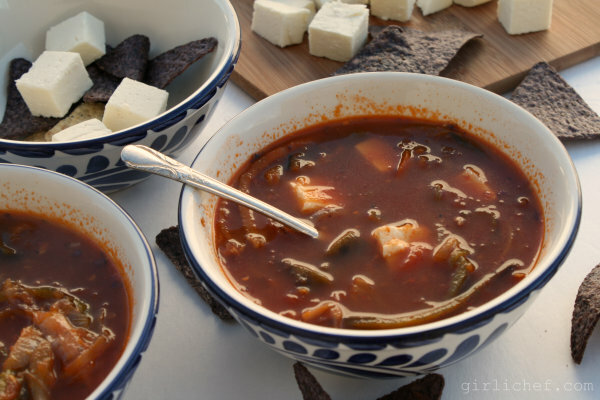 Don't forget the cubes of fresh, slightly salty cheese and a few tortilla chips for little variety in texture. 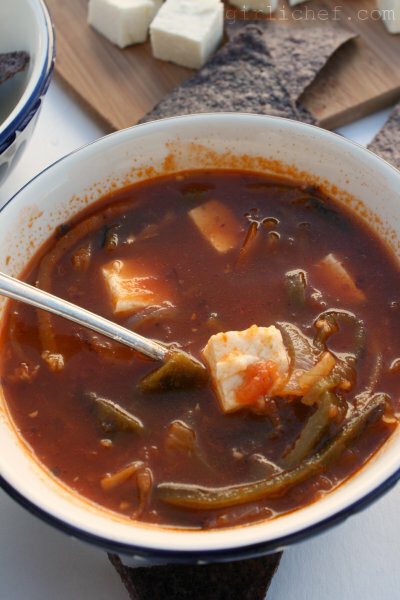 This will change the way you look at tomato soup. But what I'd really love is to have a double-feature in front of me. One small bowl of this, and one small bowl of Leslie's beautiful Homemade Tomato Soup. Slip me a grilled cheese and I might think I was in heaven. 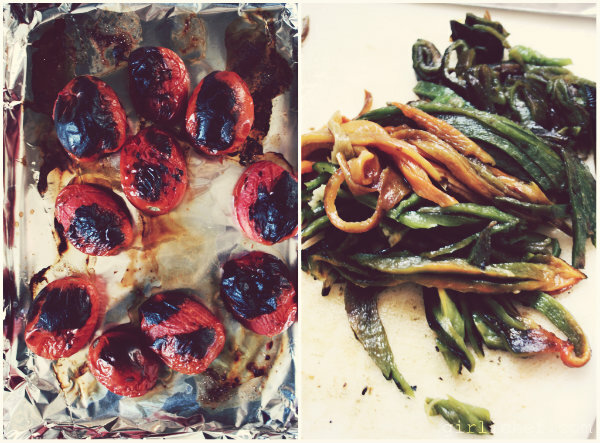 Set the tomatoes on a baking sheet that has been lined with foil and place 4-inches below a very hot broiler. Roast until the skins are blackened on one side, and then flip and repeat; it should take ~6 minutes per side. Set aside and allow to cool. Peel the skins off the tomatoes and place the tomatoes and their juices in the jar of a blender or food processor, and process to a coarse puree. Roast the poblanos directly over a gas flame, or below a broiler until blackened on all sides, 5-10 minutes total. Cover the roasted chiles with a clean kitchen towel and allow to stand and steam for at least 5 minutes. Peel, pull out the stem and seeds. Rinse briefly to remove little bits of skin and seeds. Slice the roasted chiles into strips that are ~¼-inch wide. Heat oil in a Dutch oven over medium-high heat, add onion and cook, stirring often, until slightly browned, ~5 minutes. Add garlic and oregano and cook for another minute. Add roasted poblano strips, stir, and heat through. Add the tomato puree to the pot and cook, stirring often, until thick and reduced, ~7 minutes. Stir in the broth, partially cover, and reduce heat to medium-low; simmer for 30 minutes. Taste and add salt, if needed. 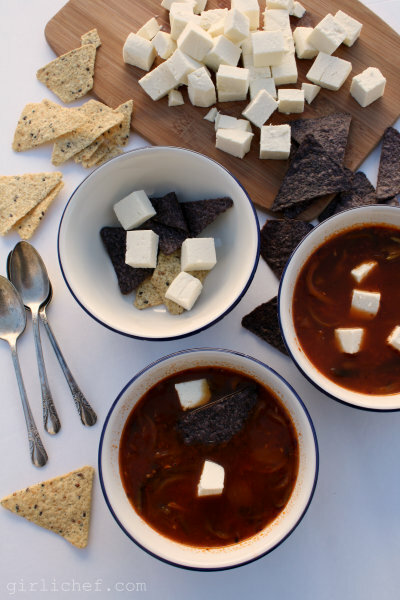 Serve the soup with cubes of queso fresco and some tortilla chips/strips. Enjoy!